At first glance this image seems much akin to “Wanderer above the Sea of Fog,” a lonely hiker standing at the edge of a cliff. This is no coincidence as Caspar David Friedrich’s paintings have always been a great inspiration to me. Their striking iconography and atmosphere are unparalleled; however, this image was not taken in Germany, Friedrich’s home country, but in Japan. Most might not be able to tell, since the fog doesn’t allow for our gaze to wander off into the distance. 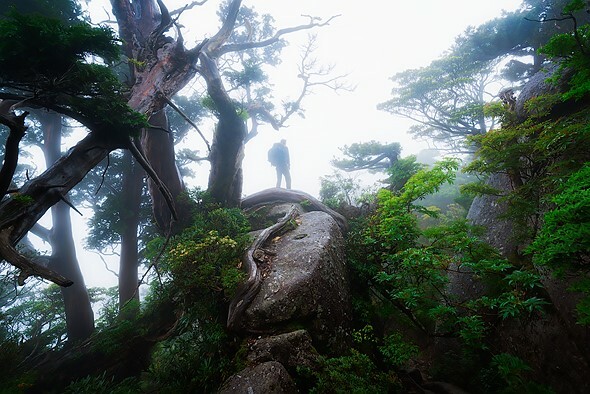 But some might have heard of the location it was shot before: the isle of Yakushima. It is a small island about 100 kilometers south of the southern most main isle of Japan called Kyushu. Its great expanses of temperate rainforest have since 1993 been part of the UNESCO World Heritage due to their diverse endemic flora and fauna. Some of the island’s Japanese Cedars are up to 7,000 years old. The forest is often engulfed by clouds hanging in the mountains which reach up to almost 2,000 meters in altitude. To explore the woods was one of my main goals when I travelled to the island earlier this year. Even though it’s the rainiest part in all of Japan I just couldn’t help to go. What awaited me was beyond what I had expected. It was much like what I had seen in Princess Mononoke—a movie the setting of which was largely inspired by the forests of Yakushima. Actually so much so, that there is now a small part of the forest titled “Mononoke no Mori,” which translates as “Mononoke’s Forest. For four days I hiked with my friend Philipp Lutz along the Yakushima traverse, witnessing the forest’s and mountain’s beauty. Part of the allure of the place was the fact that it is not very well known in the western landscape photography realms; something which comes as no surprise, given the language barrier and its distance to Europe and the US mainland. Luckily my friend and I do speak some Japanese, so it wasn’t as hard for us to obtain the information we needed to get around. This specific image was taken on the third day on the island on our way up to Miyanoura-Dake, the highest elevation of the island. Originally we had planned to get up that day, but the islands paths were quite long and winding, offering so many photo opportunities such as this one, that we spent much time just shooting the forest scenery instead of treading on, arriving a day later than anticipated. Due to the topography of the island the upper slopes of the mountain ranges are almost always engulfed in fog. When we went through the undergrowth for some time we came to a cliff where I almost stumbled down the slope as the path was taking us through the ravine you can see on the right side of the image. The old cedar trees were omnipresent and lend the forest its distinct, primordial character. With this image I tried to combine the aforementioned iconography of “The Wanderer above the Sea of Fog” with the island’s unique fauna and mood to forge an atmospheric rendition of what it was like to hike through this one of a kind landscape. It is times like these where I feel like telling people that I am inspired much by landscape painters is more than just a educational phrase to encourage students in my workshops to look beyond photography to find meaningful inspiration. I for myself might not have taken this image had I not looked at so many of Friederich’s works. This is something with may be lost on the younger generation and the myriads of instagram selfies on cliffs, but the image type is not even a product of out post-modern, self-referential crave for admiration. Instead it is part of a long tradition dating back hundreds of years. Nicolas Alexander Otto is a semi-professional landscape photographer based out of North-Rhine Westphalia, Germany. He writes for different online and print media, teaches workshops for several agencies, sells prints and calendars and offers post processing sessions. You can find more of his work on his website, Facebook and Instagram.